The new Apple iMac 2012 is the brand's slimmest yet, but what else does it offer? The new iMac 2012 from Apple is thinner and more powerful than its predecessor but lacking an optical drive. Do you care? Lest we forget, amid the ballyhoo surrounding the iPad Mini's announcement, that Apple simultaneously promised to give its new iMac range a fresh lick of aluminium. What seems like an eternity later and here we are, typing on said upgrade. The biggest feat of engineering change rests with the incredibly svelte display, which measures 5mm at its thinnest edge. Used in high-performance engineering, Apple has employed 'Friction-stir welding' to create the super-thin, single piece of aluminium that surrounds the LCD screen. However, while Apple claims that 40% of volume has been shaved off from the previous generation, the footprint depth of the whole unit is 6.9-inches - half an inch less than that of the iMac 2011. Those with narrow desks might find that the 21.5-inch LED-backlit screen is pressing up against their face, which is apt considering that Apple has actually brought the (non-Retina) 1920x1080 res, IPS LCD, 2mm closer to your nose. Slap a new coat of anti-reflective 'plasma deposition' tech on the cover glass and you've got the most glare-free display we've ever seen on a desktop. Colours are full and vivid, blacks are full. It's a real showcase piece. Despite the trimming, Apple has managed to up the performance. Supplied with OS X Mountain Lion, the model we looked at had a 2.9GHz quad-core i5 processor at its centre with 8Gb of 1600GHz DDR memory, a 1TB Fusion Drive (more on that below) and a NVIDIA GeForce GT 650M graphics chip. Resource-hungry software, graphically demanding tasks and polygon-shifting games all motored along without a glitch. It's not revolutionary (similar technology appears elsewhere), but it's more proof that Macs continue to compete with PCs on any level. However, something had to give and, for the first time in the iMac's 15-year history, there's no optical drive. For some, this will be a necessity and a sour point. For others, they won't be able to remember the last time they put a CD or DVD into a computer. Apple clearly wants you to ditch physical media, but still offers its SuperDrive (£65) and still supports Remote Disc. Combining HDD and SDD drives to perform power-specific tasks isn't anything new but, in typical Apple fashion, the fiddly management is taken out of your hands. To put it plainly, the 1TB Fusion Drive is, essentially, a partition that uses SSD for things like loading apps quickly and accessing frequent files, while the HDD stores archive material and less-used software. The clever part is how, depending on what you do and use, the Fusion drive will continually fine-tune its operation to give you the fastest computing experience possible. It sounds like a fragmentation nightmare, but seems to work a treat. Oh, and it only works with Mountain Lion. Connectivity wise, the iMac is bestowed with four USB 3, two Thunderbolt, SD, Ethernet and headphone sockets. All of which are located at the back. There's no FireWire but new dual-array mics for improved background noise elimination – effective in Face Time and Skype calls - and down-firing speakers, which impressed us in terms of high/mid clarity, if not a little bass flat. The iMac 2012 is superbly crafted, highly-capable and with a screen to die for. 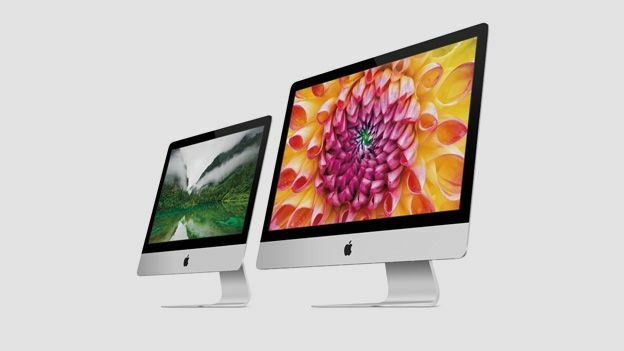 Owners of 6th-gen iMacs need not apply, nor do PC fans that equate power to price. But, for anyone requiring the best-looking desktop on the market, which is also highly capable, meet your new best friend.